The Living Tongues Institute needs your support. We are putting forward a new way to contribute to our projects: Adopt-a-language is an innovative donation tool that allows you to donate to the language revitalization program of your choice. In choosing a language to support, you are helping linguists and language activists document, conserve and maintain a language. You are also helping future generations gain access to printed materials or online resources produced in their own language. Please donate generously to this work! We appreciate your support. In addition, we are in the process of developing our online store, where you can purchase beautiful limited edition screen-printed Living Tongues t-shirts and bags. All of our products are made with environmentally friendly materials, such as canvas, cotton and water-based inks, and all of our screen-printing is hand-made by our local staff in the United States. 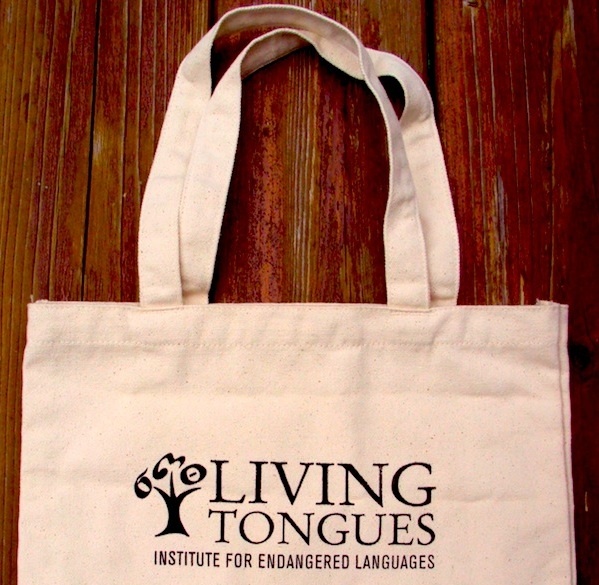 This entry was posted in Support Endangered Languages and tagged donate, Dr. Gregory D. S. Anderson, Dr. K. David Harrison, endangered languages, etsy, Language Hotspots, living tongues institute, screen print, store, support, The Linguists by livingtongues. Bookmark the permalink.